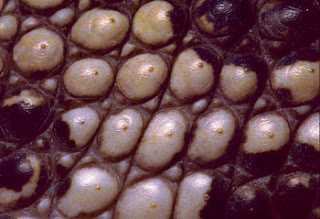 Crocodiles are covered in a scaly skin. And on each scale are tiny pressure receptors called ISOs, or "integumentary sense organs". These are very densely packed onto the scales around the jaws, but can also be found across the whole body. Well, except alligators and caimans. 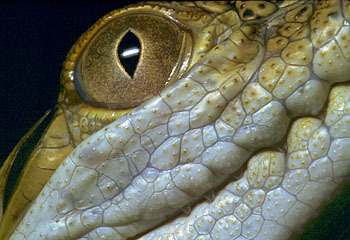 For reasons that aren't entirely clear, alligators and caimans have no ISOs on their body scales, only on the head. It's been known for decades that ISOs are sensitive to pressure. They function as mechanoreceptors, which means that when they are deformed by pressure, they send a signal to the brain. Touch something with your fingertip - the texture you're feeling is the result of tiny deformations causing nerve signals to be sent to the brain which interprets them appropriately. As a result of this study, we know that the pressure-sensitive ISO organs on the head and jaws of crocodiles are so good at detecting pressure changes, they are even more sensitive than human fingertips. That's pretty darn impressive. Earlier work suggested that ISOs served to detect pressure changes at the water's surface, but this latest study proves they're a lot more versatile than that. They can detect a wide variety of touch sensations, pressure changes, and vibrations. Everything from delicately manipulating hatchlings to detecting minute pressure changes created by fish swimming past their jaws in the water. And more. We're working on one particular study at the moment that has just had a lot of light shed on it by this news. Impressively, the study also clearly shows that the ISOs on the body also function as mechanoreceptors. The feet in particular are very sensitive, and could detect pressure changes in the water (and certainly touch). I once described the crocodile as being surrounded by a pressure sensitive net, so it's very cool to see the science behind it detailed so thoroughly and effectively. I strongly recommend that you read the full paper at the Journal of Experimental Biology. There are some very cool diagrams of nerve networks, and it will really give you an appreciation for just how remarkable the ISO system is for crocodiles. Hey! How'd I miss this post? ... great work Doc - really interesting, recently I read about the research going into the tactile sensitivity that Crocs posses through their teeth [obviously answering the question of how mum can so confidently take young into her mouth after hatching eh?]. Love this stuff ... thanks for taking the time to share it.